The earliest reference Hobson-Jobson gives is "a.D. c. 60.–"Of that which is called [xxxx] one kind is produced spontaneously, being as it were a scum thrown out by the Indian reeds; but that used for dyeing is purple efflorescence which flots on the brazen cauldrons, which the craftsmen skim off and dry. That is deemed best which is blue in colour, succulent, and smooth to the touch. Dioscorides, v. cap. 107. (Henry Yule and A.C. Burnell, Hobson-Jobson, John Murray, 1903 , p. 437). Wikipedia defines indigo asa "Species of Indigofera were cultivated in India, East Asia and Egypt in antiquity. Pliny mentions India as the source of the dye, imported in small quantities via the Silk Road. 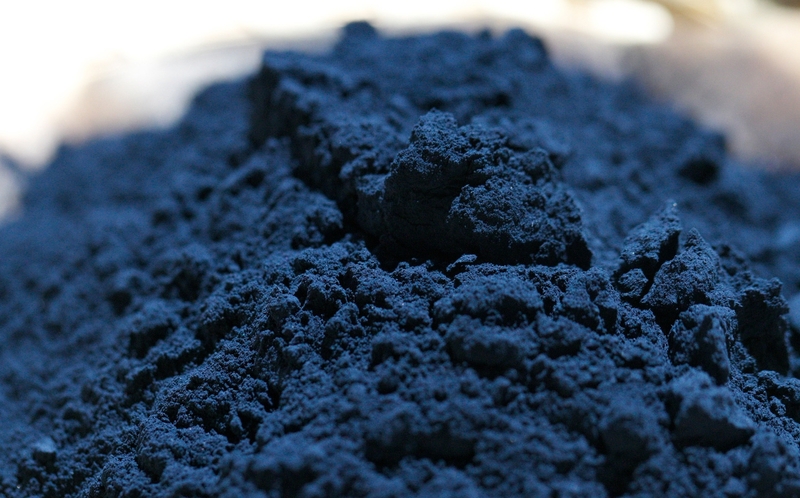 The Greek term for the dye was Ἰνδικὸν φάρμακον ("Indian dye"), which, adopted to Latin as indicum and via Portuguese gave rise to the modern word indigo." Gregory Possehl writes in one of the few references by an Indus scholar, "Indigo and Lathyrus odoratus, both legumes, the root nodules of which help in the natural fertilization of the soil, were once widely cultivated in the western region of the subcontinent. Their cultiuvation was stopped by the British and this adversely affected soil fertility (Harappan Civilization, p. 35). Ray's is an excellent story, with a twisted ending that plays with the figure of the researcher and the historical indigo planter. It is hoped that future research shed better light on the connection if any between Indus economy and indigo.